Welches, Oregon is positioned to give the best-centralized access to a region offering world-class fly fishing opportunities, year around. We are located half way between the North Pole and the equator. This provides the perfect climate for trout, salmon and steelhead fly fishing year round. Here is incredible diversity. Within a 100-mile radius, the landscape is divided by the Cascade Mountains. The west half is rain forest. The east half is desert. Elevations reach from sea level to above the tree line. There are lakes, rivers and streams in all these divergent climate zones. And all are playgrounds for fly fishers. The mighty Columbia River is to our north. The world famous Deschutes River is an easy drive to the east. Lesser-known rivers such the Clackamas, Hood, Klickitat, Wind and our own home water the Sandy River offer solitude and prolific runs of salmon and steelhead. In our surrounding area are nearly 100 miles of mountain streams that offer wild trout fishing to fly fishers of all experience levels. Many of our streams lie within areas of true ancient rain forests. 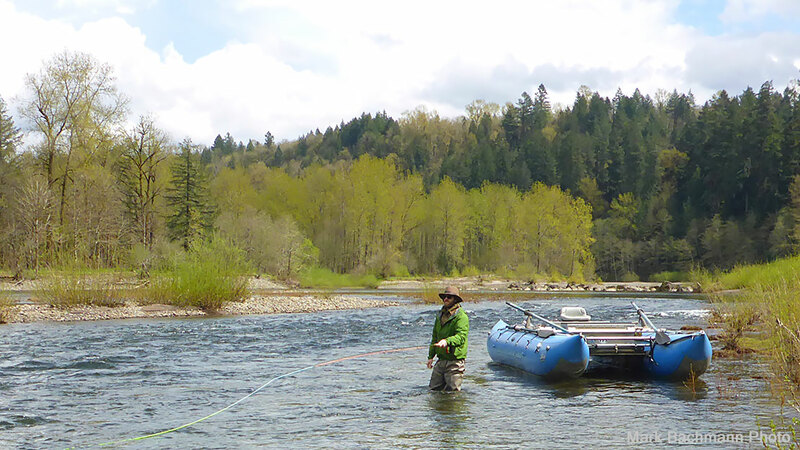 These streams in the upper Sandy River watershed are open for catch and release fishing from the last Saturday in May until October 31. They are in amazing ecological condition, and have healthy populations of both rainbow and cutthroat trout. All of the fish in these streams are protected by catch and release regulations. There are also a bunch of lakes and reservoirs in the surrounding area that are regularly stocked with trout from 8” to 12-pounds that you can keep. 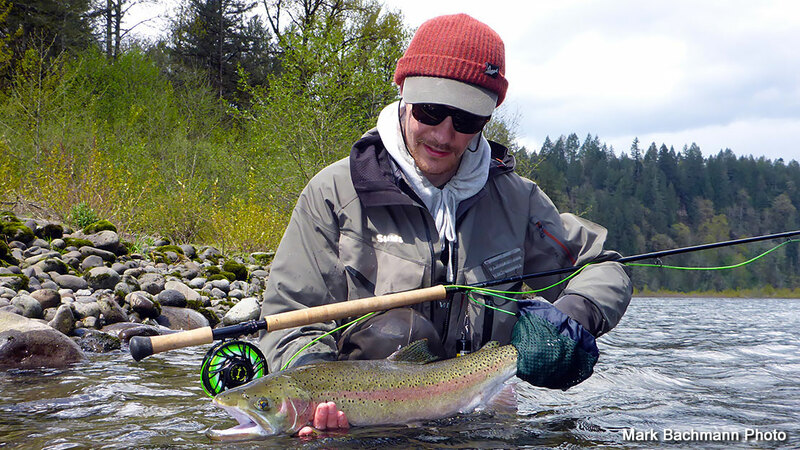 The biggest draw for fly fishers, in our rivers, is steelhead fishing. We are in lower Columbia River basin. No other region in the world offers the diversity of steelhead runs that ours does. The small town of Welches, OR is made up of amenities that make fly fishing this area comfortable: great shops (like The Fly Fishing Shop), professional fishing guides (like Mark Bachmann), unique dining, and a plethora of camping opportunities. Two fly fishing related items happened early in the week. On Tuesday, Frank Day and I floated together, each of us landed a steelhead. Meanwhile Tony barnes was hiking, and he landed two by himself. The song goes something like April showers bring May flowers. It was cycles of warm and comfortable, punctuated by bouts of screaming cold wind, and torrents of rain and hail. Wednesday I drove to Maupin to attend a guides aquatic insect identification class by my good friends Rick Hafele and Greg McMillan. There were two other shop owners, and about a dozen guides in attendance. It was a fun time, and I learned a lot. Both Rick and Greg are dedicated to the Deschutes River Alliance, which is an activist research group that is scientifically studying changes in the Deschutes River. Central Oregon is acquiring more people all of the time, which is putting certain stresses on the environment. Rivers are constantly changing from all kinds of factors. The Deschutes River is an awesome resource for recreations, including fly fishing. The Deschutes River Alliance is watching after things for us, and you might want to investigate what they are doing. Mean while the Sandy River has been in perfect shape all week, thanks to a healthy, intact watershed. Thank you everybody for helping to make that happen. Local rivers are in perfect conditions with medium water flows, mid-range temperatures, and good clarity. The Sandy, Hood and Clackamas rivers all have summer steelhead in sparse, but fishable numbers. New bright winter steelhead are still entering all the local rivers, and there are spawned-out kelts dropping back to the Ocean. Angling pressure has been comparatively light. Water temperatures are still in the mid-forties, so Skagit heads with fast sinking tips are still the best approach. Two-inch to two and a half inch long flies have been more productive than larger flies. Spring Chinooks are starting to pass Willamette Falls, and Bonneville Dam on the Columbia. There have been a few scattered around in the Sandy for nearly a month. Several have been landed with flies. There are also, big ones that got away stories, that were also undoubtedly Chinooks. This is not predicted to be a year for large runs of Chinooks, but water levels will be better than average for fly fishing. Chinooks will eat the same flies that catch winter steelhead, but flashy flies in chartreuse, blue and chartreuse, pink, and red seem to be the dominant colors. Slow and deep are key factors in presentation. The tail water fishery down stream from pelton Dam, and bordering the Warm Springs Reservation opened April 22, that closed for trout fishing last October 31, which means the trout are still pretty niave by the time this blog comes out. Who wouldn't enjoy the company of a large dumb trout. Get out there! Oregon Department of Fish and Wildlife just did a sampling of the trout population on the lower Deschutes River and concluded that the population is healthy. Stomach samples disclosed that the main food items were stonefly nymphs, caddis pupae and crayfish, no surprises there. The Deschutes is running high and slightly off-color, but fishing has been pretty good for native redband trout. Anglers fishing the bottom using a mixture of Stonefly Nymphs, Glo Bugs and San Juan Worm type flies have been doing the best in the stretch from the northern border of the reservation to the mouth of the river. Since the water is high, look for soft spots on the inside of curves in the river. Dry fly fishing has been pretty slow, but that will change as the water warms with increasingly warmer night temperatures. Rock Creek and Pine Hollow Reservoirs are full and have been stocked with trout since mid-March. Stocking will continue through April and May. Theses are the best two early season float tube lakes in our area. Harriette Lake in the upper Clackamas drainage is accessible and has also been stocked. Clear Lake, Laurance Lake, Lost Lake and Trillium Lakes are still snowed-in and won't be stocked until May. Out in the Central Oregon desert, Chickahominy Reservoir is 3/4 full and trout fishing has been pretty good for hold-over rainbows in the 12-18 inch range. No doubt that tarpon are starting to show up in the back country of South Florida, and the coast of Belize. Belize can also offer some prime permit fishing in April. 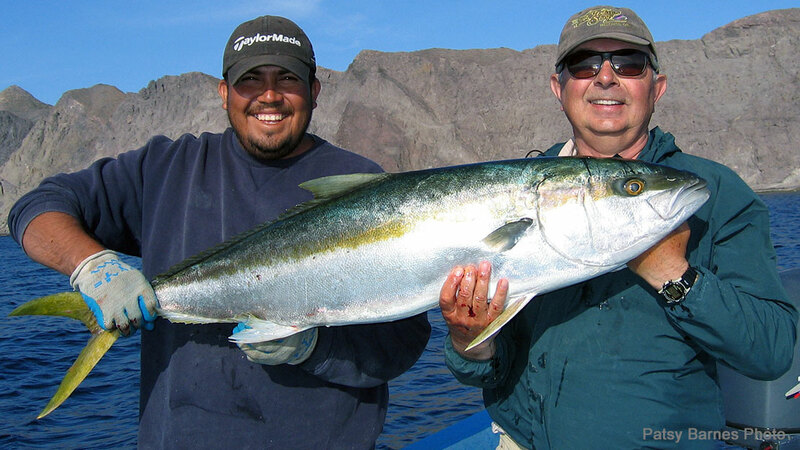 Yellow Tails will be the big draw in the Sea of Cortez.